Pearls of Wisdom: Oysters Are Smart Food. 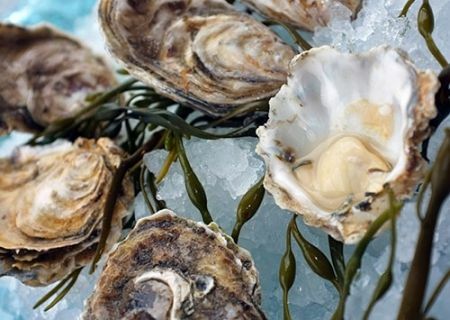 Northwest waters are getting colder now and that means it’s time to have oysters on the brain. In fall and winter months, water temperatures become ideal for the sweetest, plumpest and tastiest oysters. These marvelous mollusks are a smart choice when it comes to nutrition because they are considered an excellent brain food. Oysters have long been known for their low fat and low calorie content and some of the highest quality protein you can find. But beyond the protein there are many key essential ingredients that our brains rely on for functioning best. In scientific studies we find that children’s brain growth and development and the protection of the older adult brain rely heavily on the important nourishing ingredients found in oysters. Omega-3 fatty acids, calcium, iron, selenium and zinc all play a huge role in the maintenance of our grey matter. Tyrosine, an essential amino acid, also boosts alertness, functionality and the ability to handle stress. In scientific studies we find that children’s brain growth and development and the protection of the older adult brain rely heavily on the important nourishing ingredients found in oysters. Although oysters as a species do not appear to have a head, they certainly might be considered one of the brainiest foods on the planet. The prudent oyster has found an astute way to endure through millennia of time by surviving and adapting to its environment. Don’t you think those are clever traits for all of us? If we study it closely the oyster will share with us its pearls of wisdom. In the environments where oysters exist, they are exposed to a wide variety of stresses, and because of this they have learned to adapt. Take their water for instance. Salt water and fresh water are quite different and generally have inhabitants that can specifically tolerate one or the other. Oysters find a way to survive in varying levels of salinity and therefore can deal with a little of both. The oyster also is a species that can live either in water or on land quite unusual. Guess what happens when the tide goes out? The oyster adapts. Oysters are not like fish out of water; they very astutely realize that the tide will come back in and just patiently lay in wait. What about temperature? Water temperatures where oysters can be found vary greatly, and they can tolerate wide swings in this regard. They survive in the cold waters of the Pacific Northwest and Alaska or in the warm waters of Florida. When the oyster genome was recently mapped, they found that it contains a stress adaptation gene that allows it to tolerate temperatures as high as 120 degrees Fahrenheit. We can learn from the oyster’s example of how to deal with the extremes of life, and it can give us the nourishment for our brains to do it with. I bow down to the brave one who picked up that first sharp grey stone on the beach, pried it open and popped it in their mouth. To that brilliant, brave person, I am eternally grateful.